Submersible and Intrinsically Safe Approved. The new submersible VX-820 portables offer a wide range of features in several packages. No PF keys, 4 PF keys or 12 key DTMF pad plus 4 PF keys. 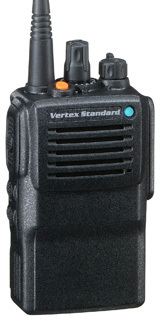 The VX-820 is similar to the GP328-plus (or Motorola EX500) in size, packs up with a nice Lithium Battery Pack and you can say good bye to the dreaded Memory-effect battery packs like Nicad or NiMh ! !